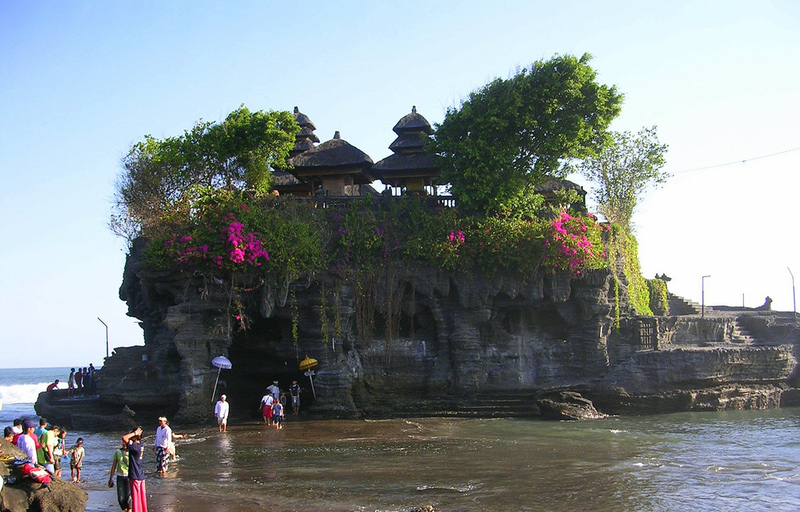 Tanah Lot Temple is located at a village called Braban, included in the administration of Kecamatan Kediri Kabupaten Tabanan. The location is 30 kms from Denpasar city, and 11 kms from the town of Kediri. The town of Kediri lies on the main road between Denpasar city to Tabanan city which is also the main road of southern area of Bali from east island to the west. Big bus can reach the parking lot that is especially constructed by local government on the beach where are also found some restaurants, shops and art shops. On the east side of parking area there are shops and restaurants, from here visitors have to walk on foot around 300 meters to the beach. On the beach again some drink stalls along the direction of east west and they put some wooden or bamboo chairs on the beach where visitors can relax waiting for the sunset. No historical record is found so far to construct the history of the temple. Scripture of Dang Hyang Nirarta ( a fairy priest from Java ) mentions that the priest Dang Hyang Nirarta had visited the temple and asked the people around the area to build shrine. While the priest also educated fishermen there in making fish trap. 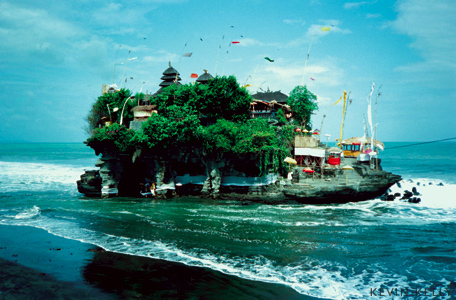 The temple as a whole has 8 shrines with Merus ( superimposed roofs ) assemblaged on the narrow cliff that bulges up from the sea bed. Seen from the name of main shrine it suggests that the temple was built to honor a person who probably had important rule at the area with posthumous name as " Pemekel " It is common that, when a temple is built say the main shrine indeed dedicated to god, but second main shrines in a complex is normally dedicated to persons who had dedicated himself for the welfare of the people or at least a person who had strong influence among the people. The temple as a whole is dedicated to the god of the sea. Fishermen pray to get fish and prosperity. A myth mentions that one of the shrine at Batukaru temple was lost, and was found here standing at Tanah Lot temple complex. It was very probable that the temple was built by Mengwi kingdom as the sea temple. The kingdom of Mengwi was flourishing around 1750 according to manuscript, and built their capital at present day Mengwi town, also popular as tour visit for its temple called Taman Ayun. The palace was just on the west side of Taman Ayun temple along the road side up to the corner of cross road. The kingdom ever ruled large part of Bali, even up to the present day Kabupaten Banyuwangi in east Java, and one of kingdom built so many temples inherited to their people. Toward the end of 19th century the kingdom was declining very quick due to conflict with their minister known as I Pasek Badak, from the village of Buduk near krobokan town kuta. it was probable that royal family wish to take the position of Badak as minister because Badak was not from Arya family ( not with title I Gusti ), yet Badak show resistant and open war was un avoided. Royal family was almost defeated when Badak realized that to many people become victim of unnecessary conflict and he informed the royal family that he would give up his resistant, and asked to be killed by the king. As the respect to Badak who ever growing Mengwi kingdom, royal family worship him as great warrior at the main temple of Taman Ayun where one can see the shrine especially dedicated to I Pasek Badak and the royal family regularly during the ritual worship him at front of his shrine. A kingdom in Bali normally had 3 main temples, one located near the sea, one in the city or near the palace, and one on the mountain or near the mountain. This concept of 3 temples has also influenced the smaller unit of Balinese settlement in the level called " Desa ". Every Desa in Bali has also 3 main temples dedicated to different way of worshipping the god and ancestor's spirits.